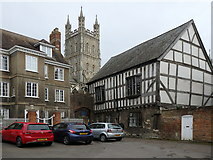 To celebrate Geograph's 14th birthday, a group of Geograph-ers followed Phillip Halling's call to come to Gloucester for lunch at the Fountain Inn, followed by a town walk. Phillip guided us around the cathedral precinct and the docks and treated us to his detailed and interesting commentary on all aspects of the city's history from Romans to mediaeval times to early industry. From the pub in Westgate Street , we walked through College Court to Cathedral Close , then around the Cathedral via the Little Cloister on the north side to Miller's Green , where the Parliament Rooms and Almoner's Lodgings are located. Outside the cathedral precinct, we visited St Mary-de-Lode church and the ruins of St Oswald's Priory, then returning to Westgate Street. Walking past the Shire Hall and the former Blackfriars' Abbey, we then approached the docks with its mills and warehouses . Victoria Dock is now a popular moorings and marina, and many of the former warehouses are used as office space now. The oldest of them, North Warehouse , stands at the northern end of the Main Basin , next to Gloucester Lock, the connection to the River Severn. I discovered a working split hopper barge here, as well as an old steam crane placed in front of the warehouse to represent the machinery which would once have been operating on the quays. A walk along the Main Basin followed - at the southern end is the Mariners' Chapel and the National Waterways Museum in Llanthony Warehouse , where a steam dredger can be seen moored in the Barge Arm. After a quick sprint along the east side of Victoria Dock to catch up with the rest of the group, we met at Southgate Street beneath Kyneburgh Tower and walked back towards the city centre and St Mary-de-Crypt church and the original Crypt School . From here, it was only a short stroll past Emperor Nerva's monument and the Cross (the centre point of the city since Roman times) to the New Inn , a mediaeval inn built around a courtyard with first-floor galleries to accommodate visitors to St Peter's Abbey, where we disbanded. Many thanks to Phillip Halling for organising this meet and for sharing his knowledge and enthusiasm for history and for presenting it so well. For a group photo from the trip, see Link . You can see this trip plotted on a map on the Geo-trips page Link .